Featuring special guest producer Ski Beatz and artist/producer/Dubspot instructor Dan Freeman (CØm1x). With production credits spanning the albums of Jay Z, Camp Lo, Mos Def and more, Dubspot guest artist Ski Beatz has spent over two decades influencing hip hop culture’s global soundscape. Most recently, with the release of his 2010 debut album 24 Hour Karate School, Ski set off on a solo journey, which has since spawned numerous educational pursuits under the 24 Hour Karate School guise. 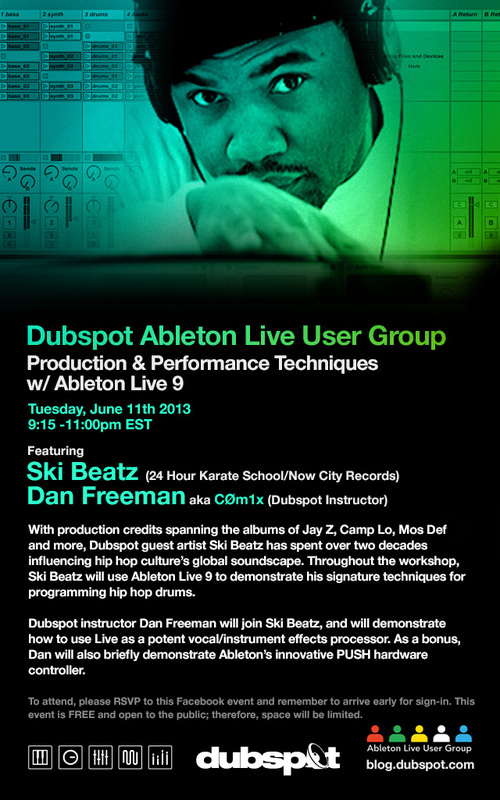 Throughout the workshop, Ski Beatz will use Ableton Live 9 to demonstrate his signature techniques for programming hip hop drums. Dubspot instructor Dan Freeman will join Ski Beatz, and will demonstrate how to use Live as a potent vocal/instrument effects processor. As a bonus, Dan will also briefly demonstrate Ableton’s innovative PUSH hardware controller. To attend, please RSVP to this Facebook event and remember to arrive early for sign-in. This event is FREE and open to the public; therefore, space will be limited.